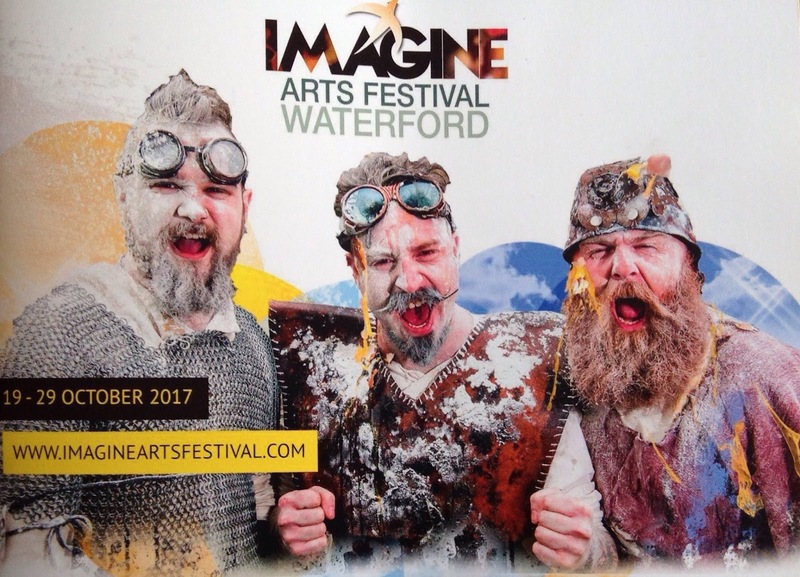 As part of the Imagine Arts Festival the local Waterford Archaeological & Historical Society will launch their latest Journal No. 73 which covers many topics from archaeological excavations in County Waterford to the former Waterpark student who established the Irish Air Corps. Two of this year’s contributors will give a talk on their respective topics: Richard Tobin, The Cooper, The Racer and the Draper’s Curate: Settling accounts in the Ballyduff National League 1880 to 1891 / Brigid McIntyre, John Cotter - From Aglish to America: a stirring story of a forgotten hero of the Gaelic Revival. 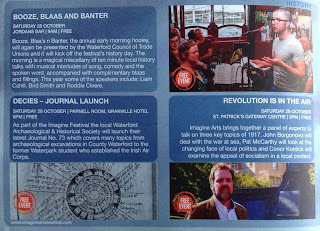 Journal for sale at €15. The Waterford Archaeological and Historical Society lecture season for 2017 and 2018 commences on Friday 29th September with an illustrated lecture at 8 pm in the St Patrick’s Gateway Centre, Patrick St. Waterford by Mr. Tony Gyves MA titled ‘Waterford district lunatic asylum 1834-1922’. There is much contemporary discussion about the provision of mental health services in the community. 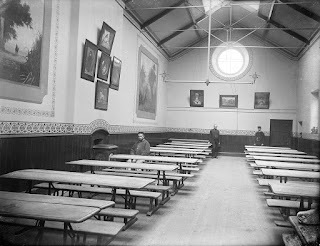 In Ireland organised treatment for people suffering from mental illness was provided in a network of district lunatic asylums established in the early nineteenth century, these were effectively Ireland's first mental hospitals. The Waterford district lunatic asylum was opened in 1834 on a site on the edge of the city, surrounded by orchards, market gardens and farmland in Lower Grange. At the time of its establishment ten staff delivered care to 54 patients, or inmates as they were called, in a purpose-built modern facility. The original asylum building, designed by the leading architect Francis Johnston, still stands in the grounds of St. Otteran’s Hospital and is a protected structure. Tony Gyves has researched the history of the Waterford district lunatic asylum from its opening to Independence in 1922 when a new system for administering mental health services was established in the Free State. In his talk Tony will describe the facilities in which the patients received treatment and the types of care they received in the asylum. His talk will also look at the evolution of medical practices and administrative systems for caring for the mentally ill in Waterford in the 19th century, and the people who were involved in delivering that care. Mallow-born Tony Gyves started his career in health administration working for Cork County Council, this was followed by periods spent working in the Southern, Midland and South-Eastern Health Boards, before ending his career as a senior administrator in St. Otteran’s Hospital. His time spent working in St. Otteran’s stimulated an interest in the history of the place and in the little researched area of the provision of services to the mentally ill in 19th century Ireland. He was awarded a Master of Arts degree in Local History by University College Cork for his ground-breaking research on the history of the Waterford district lunatic asylum. This lecture will appeal to anyone interested in the history of this well-known Waterford institution, the social history of the City and County in the 19th century and the development of medical services in Victorian Ireland. 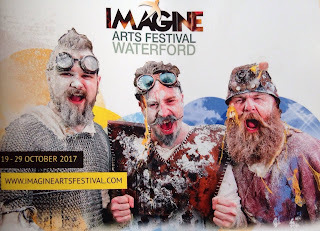 Admission to the lecture is €5, but is free for members of the Waterford Archaeological and Historical Society. 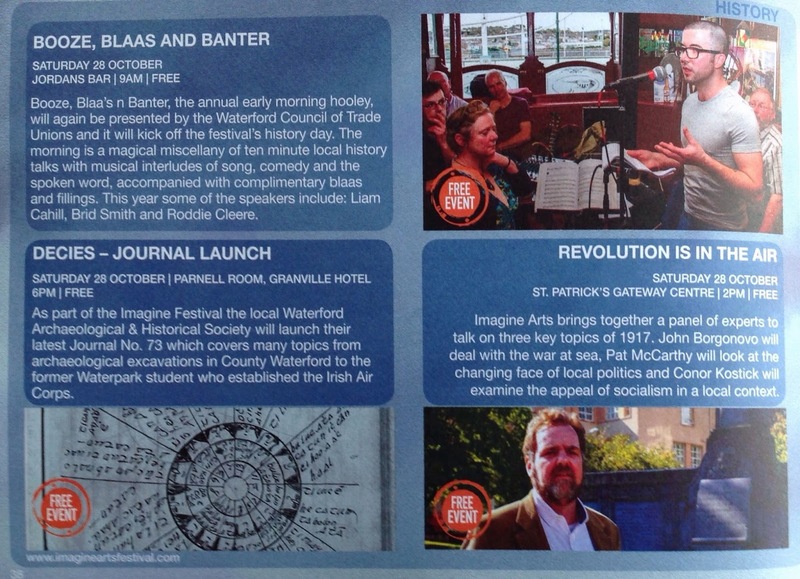 Details of the full programme of monthly lectures can be found on our Facebook page www.facebook.com/waterfordhistory/. New members are always welcome, the membership application form can be downloaded from http://www.waterford-history.org.